Welcome to the Geocaching Ireland website. Here you’ll find an introduction to what Geocaching is all about, the do’s and don’ts for placing your own cache, news, events and much more. We are also delighted to provide help and support to those planning a caching trip to Ireland, from where to go, and how to get there. 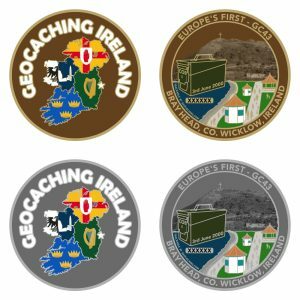 Geocaching Ireland was established on August 9th 2003 on Yahoo Groups and the aim was to establish an active geocaching community in Ireland, North and South through the group, which was successfully achieved. The Geocaching Ireland website was then born on the 24th May 2004 in an effort to provide easy to access information on Geocaching in Ireland. On the 20th January 2005 the group started to move over to the more user friendly Geocaching Ireland Forums. As we moved into the social media era so did our forums users, and as of March 13th 2717 we closed the forums, however the discussion still continues on the Geocaching Ireland Facebook Discussion Group. On June 3rd 2017, a Geocoin celebrating GC43 was launched. The front side of the coin features the Geocaching Ireland logo while the back side of the coin features the iconic view of Bray Seafront Promenade and Bray Head. Bray Head will be featured in “3D” and raised on the coin. GC43 is represented by an ammunition container with the placement date inscribed on the front. There is also a nod to the original CO Chris with “COB” inscribed on the side of the container.